Its been ages since I baked these little temperamental sweet babes, until I received a request from my little missy. She volunteered to bring some sweet bites for her music class, and that sweet bites is none other than…. "Stick to the usual please" was her plea, knowing that her mom may came up with some 'weird' flavoured macarons. Based on 'Secret of Macaron" by José. Everything went well, follow each steps to the T, even the salted caramel, no major disaster except for few minor tweaking with oven temperature. All was peachy rosy until…. …its time to pipe the salted butter caramel. Piped on to few macaron shells, it was runny as milkshakes, didn't hold its shape at all, aarrrghhh… crisis!!! These macs got to be ready by tomorrow!!!! was all I can think of , annoyed! Reached out for Nuttella jar, just in case…..
Lightbulb moment: why not try to whisk this again and see what happened! Moral of the story: the book is there to assist but it will not tell you the whole story, its up to us to create our ending …. be it happy or otherwise. sift, silicone spatula, clean bowls (at least 2), kitchen scale, Sugar thermometer, oven thermometer, Baking papers (with 1 baking paper with circles of 1 1/2 inch drawn as a template, 1inch spacing between circles), piping bag and 8mm nozzle, colours (if used), mixers (Kitchen Aid, Kenwood etc) …anything else I forgotten to list down? Sift almond meal with icing sugar twice. Set aside. Gently beat half the egg white to soft peak. In a heavy base saucepan, add 75ml water to 200g caster sugar. Bring sugar to boil (do not stir) until it reach to a 105C, increase the speed of Kenwood (because I use Kenwood :D). Let the syrup boil until it reach 115C, take it off the heat and pour into the meringue in a thin stream while keeping the beaters on at high speed. Continue to beat the meringue for another 8 minutes. Use the remaining egg white to mix with the almond meal mixture into a paste. Using silicone spatula, incorporate 1/3 of meringue into the almond mixture (note: good to work out and flex your biceps, trust me this is hardwork!!!). Add the rest of the meringue. Start counting…. a good 50 strokes (I'd stop at 45 and check its consistency) would suffice. Fill up the piping bag and start piping onto baking paper. Tap hard the baking tray (I dropped the baking tray few times and dropped it hard on the kitchen bench top, use toothpick to get any bubbles out). Leave it to dry for 30 minutes to form a crust. Melt sugar with water in saucepan over medium heat until the colour turned amber light brown. Add cream little by little and keep stirring. Once the cream is well incorporated, stick sugar thermometer bring to boil until it reach 108C. Remove from heat and stir in butter cubes and salt. Transfer to a clean stainless steel bowl. Place a piece of Gladwrap on the caramel to avoid from skin forming. Place it in refrigerator for at least 4 hours. Just before piping, use an electric beater and beat the salted butter caramel until thicken. 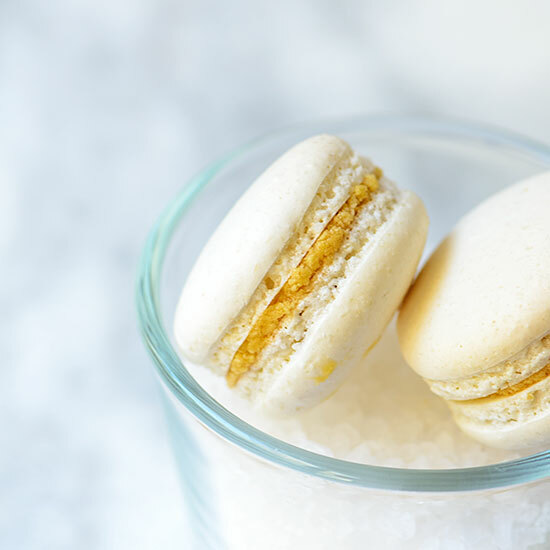 Pipe the salted caramel onto half of the macaron and and top with another. Give it a good gentle squeeze. Refrigerate overnight for full flavour. Pretty, perfect and extremely tempting! A great flavor combination. Look at that feet.... aren't they gorgeous looking!! So perfect!! They are beautiful with perfect feet and lovely salted caramel filling, Lisa. Oh wow. I wish I could say something original but as everyone else has said, these look perfect! I yet have to try making mac...thanks for the recipe...one of this day I will have to give this a try. Totally my type of afternoon pick-me-up with a cup of tea. YUM!